If you are a family of four, most of the RV models out there will work just fine. Sure you might have to convert the sofa or dinette, but everyone will have bed and hopefully sleep soundly. This brand new floor plan offers a fifth-wheel like bunkhouse with spacious double over double bunks and a half bath just for the kiddos. There are also enough drawers and shelves to keep all of those socks off the floor! The kitchen has a stylish island and parents get a nice, private bedroom up front. This particular Jayflight is one of the best selling family floor plans in the industry. The bunkhouse has its own slide out and gives the kids plenty of room to stretch their legs. This particular model has three dedicated beds for the kids and additional convertible sleeping space. The central living space is open and airy with nice counter space and plenty of room to stock a week’s worth of groceries. Parents also get a private bedroom with sliding wooden doors. This Luxurious Grand Design fifth wheel may be an outside the box option for the larger RV family, but we think it offers plenty of space for you and your brood. There is a large bunk bed on top of a separate, enclosed room with a fold out sofa that looks mighty comfy. Two kids could sleep on the bunk up top and and two kids could sleep in the bonus room right below it. The whole family could share the open floor plan in the living room kitchen area and everyone would have plenty of options for comfortable seating. This is our favorite “Class C” floor plan for families. Dedicated bunk beds and a gigantic bed over cab could easily sleep four kids without ever having to convert a dinette into a bed. The master bedroom is also spacious and comfortable, though the hallway that leads to it is quite narrow. A large bathroom with doors leading into the master and the main living area top off a very functional family floor plan. 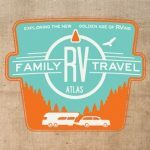 If you have a larger family, you may have to search a little harder to find an RV that suits your needs. But don’t despair–there are definitely options out there that will fit all three, four, five, or six of your kids. Any more than that, and someone might be sleeping in a tent.